To address the anatomical and functional properties of basal ganglia circuitry, our laboratory applies and develops a variety of molecular strategies (ex. virus-mediated tracing and gene expression, transgenic mice expressing marker proteins in specific population of neurons) together with electrophysiological approaches. Furthermore, we applies cell-type specific or input-specific optogenetic manipulation in vitro and in vivo in pharmacological animal models of human disease as well as a battery of behavioral testing. 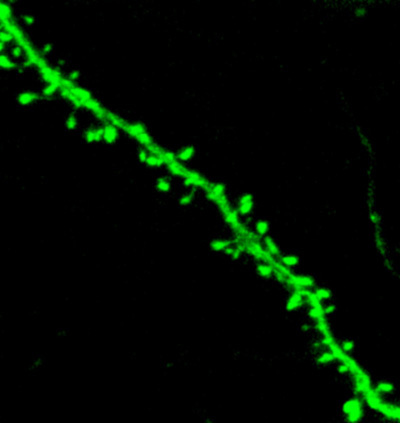 Future research in my own lab will continue with this strategy and set out to anatomically and functionally define neuronal identity and connectivity of brain circuits beyond basal ganglia and their interplay in mediating reward- and motivation-related behavior in the pathogenesis of neuropsychiatric and neuropathological disease. 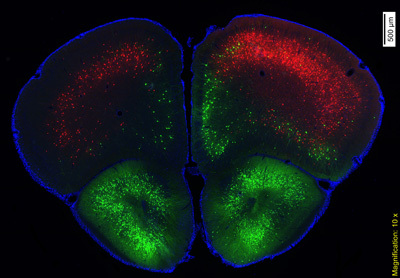 Double rabies virus-mediated retrograde tracing showing cortical neurons projecting to dorsal striatum (red) and neurons projecting to nucleus accumbens (green). Shin, S., Pribiag, H., Lilascharoen, V., Knowland, D., Wang, X., Lim, B. K. (2018) Drd3 signaling in the lateral septum mediates early life stress-induced social dysfunction. Neuron, 2018 Jan 3. Liu, J., Conde, K., Zhang, P., Lilascharoen, V., Xu, Z., Lim, B. K., Seeley, R. J., Zhu, J. J., Scott, M. M., Pang, Z.P. (2017) Enhanced AMPA Receptor Trafficking Mediates the Anorexigenic Effect of ndogenous Glucagon-like Peptide-1 in the Paraventricular Hypothalamus. Neuron. 2017 Oct 13. Yoo, J. H., Zell, V., Wu, J., Punta, C., Ramajayam, N., Shen, X., Faget, L., Lilascharoen, V., Lim, B. K., Hnasko, T. S. (2017) Activation of Pedunculopontine Glutamate Neurons Is Reinforcing. J Neurosci. 37(1):38-46. Rothwell, P. E., Hayton, S. J., Sun, G. L., Fuccillo, M. V., Lim, B. K., Malenka, R. C. (2015) Input- and Output-Specific Regulation of Serial Order Performance by Corticostriatal Circuits. Neuron 88(2):345-356. Rothwell, P. E, Fuccillo, M. V., Maxeiner, S., Hayton, S. J., Lim, B. K., Malenka, R. C., Südhof, T. C. (2014) Autism-associated Neuroligin-3 mutations impair striatal circuits underlying repetitive motor routins. Cell. 158(1):198-212. Lim, B. K., Huang, K. W., Grueter, B. A., Rothwell, P. E., Malenka, R. C. (2012) Anhedonia requires MC4R-mediated synaptic adaptation in nucleus accumbens. Nature (Article) 487(7406): 183-189. Byungkook Lim received his Ph.D. in Molecular & Cell Biology from UC Berkeley with Dr. Mu-ming Poo and carried out his postdoctoral training with Dr. Robert Malenka in the Department of Psychiatry and Behavioral Science at the Stanford University School of Medicine. 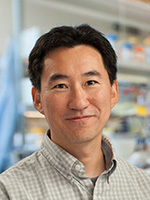 Byungkook is a recepient of Kingenstein-Simmons Fellowship, Searle Scholar Fellowship, NIMH Biobehavioral Research Awards for Innovative New Scientists (BRAINS) and BRAIN Initiative Cell Census Network (BICCN) awards.